It's Friday again! Good thing this day comes every week. Otherwise there would be less Fabergé posts... For this week I have chosen a pretty bonbonnière, made around 1896 - 1908! 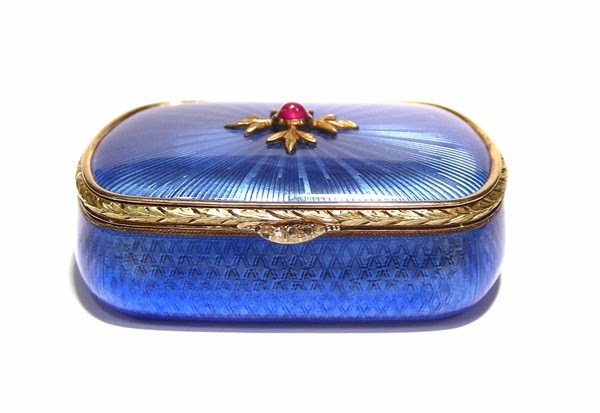 The box has a rounded cushion shape, and is enameled translucent royal blue over a moire guilloché ground on the sides, and a sunburst guilloché pattern on the top. In the middle of the lid sits a cabochon ruby, surrounded by four golden leaves. Around the edge of the lid runs a border of chased yellow gold laurel leaves, and the thumbpiece is set with five graduating rose-cut diamonds. The interior of the bonbonnière is guilt. You can find it over at Wartski. 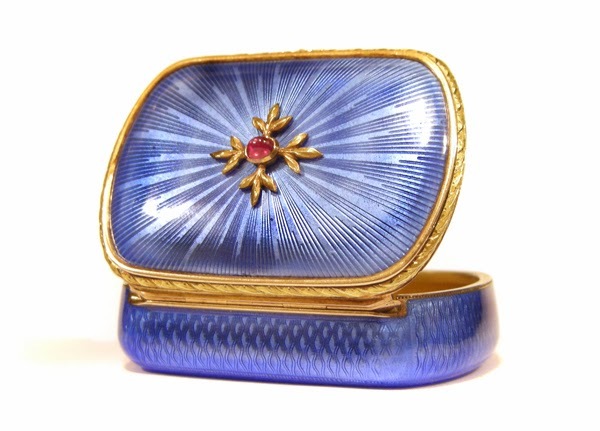 Such a beautiful little case, I just love the striking blue Miss Meadows.